Managers today need the capacity to coach and develop their employees. To do so, managers must be able to connect with their employees, to understand what the employee needs and how they can offer support. The structure of an organization is moving from hierarchal to a more fluid team based approach, therefore, managers can’t just tell employees what to do or hand out directives, they have to coach the employees on how to do their job. Great managers don’t hoard talent. They actively encourage good employees to chase the next position. They are never worried about a shortage of workers because they are known as talent developers and have a line of people waiting to work with them. I believe there is one trait that is more impactful than all others: a strong desire and ability to help your team members level up. As a manager you have the ability to make a massive impact in the lives of your direct reports, including improving their skills and compensation. Here’s a specific example: I teach all of my direct reports how to negotiate their salary, because even though it costs us a little more in the short term, they gain a lifelong skill that will help them earns tens or even hundreds of thousands more over the course of their careers. 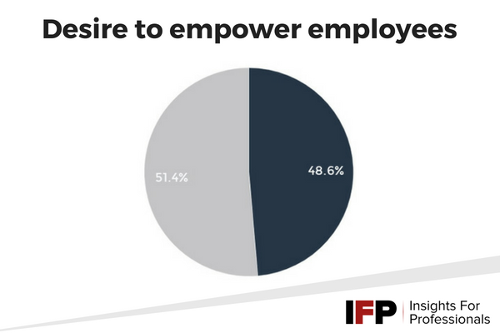 Just under half of the IFP audience we surveyed said the desire to empower employees was one of the most important characteristics of a good manager. Leadership development is about self- development. You can’t grow yourself as a leader without growing personally, and the first step in that is understanding yourself. There are a whole range of ways to understand your strengths and challenges, from personality profiles like the Myers-Briggs to communication style tests to Leadership 360-degree surveys which actually measure your leadership behaviors and put hard numbers to what was previously considered warm and fuzzy. Lead – Lead their team by example and with excellence. Engage – Engage key stakeholders at all levels to ensure effective delivery of expectations. Awareness – Be and stay aware of what’s happening within the organization to be in a position to proactively address issues and mitigate risks, especially those that impact you team. Delegate – More is done with a team. Instil trust and confidence in your team by delegating work and responsibility. People leave managers rather than companies, so making sure the management relationship someone has in the workplace is effective should be of the utmost importance within companies. Strong management is able to motivate and boost productivity of employees. If a highly-effective employee is promoted to management, their success in management will be in their ability to motivate and mobilize others. Some traits common in effective managers include a keen understanding of what makes each employee feel appreciated. Some may benefit from public praise, others from a sincere note, and yet others are appreciated by the intentional check-ins each day to feel like they are fully supported. 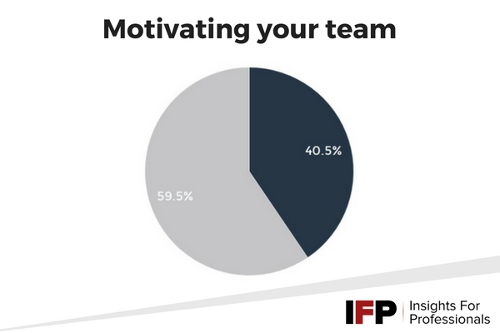 40.5% of the IFP audience we surveyed said motivating your team was one of the most important characteristics of a good manager. How could this department or business unit be improved? Given our organization's mission and competitive position, what should be our department's direction for the future? What are our department's short-term and long-term goals? How can those goals best be achieved in an effective, efficient manner? I believe that effective managers are great listeners. They are individuals who are interested in others and want to hear and learn from others before developing strategies that make for being an incredible manager. It's important to communicate and share your insight and thoughts with your team, but when your team feels that they are heard and involved in the outcomes, they become more vested in the company and their roles there. Effective managers listen, ask for input, and then socialize ideas to make sure that they are executing in a way that is effective and others are onboard. Empathy is key to being a manager because we must let our staff know that we have been in their shoes before and understand exactly where they are coming. Effectively showing empathy to staff will in turn increase the trust that those staff have for us, turn them into better workers, and increase the overall quality of that manager-staff relationship! Managers are always being judged on how their words match their actions. The most effective managers mean what they say, and follow through on their side of any bargain. Having knowledge in the area you’re trying to lead people will elevate the level of respect your employees have for you. It gives them confidence you’ll lead with knowledge rather than fear. In my experience, the most significant trait for a successful manager is relatability. It starts by building relationships and learning to interact with each employee on a one to one basis. Relating also means leading by doing, and being a good team member, not just locked away in an office one to be seen 15 minutes a day. An open door policy with your employees is critical. Nothing breaks down a team more than lack of open, honest communication. Be transparent, be honest and remember - your team members are humans, just like you. We are imperfect and beautiful in very unique ways. Have common courtesy and treat the CEO/top client the same as you'd treat the intern because again - we are all people with independent thoughts, emotions, and drives. 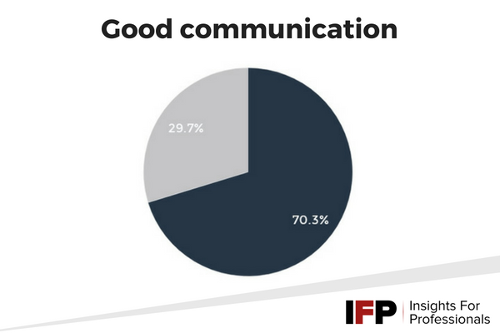 70.3% of the IFP audience we surveyed said good communication was one of the most important characteristics of a good manager.